The Lawyers of Distinction is pleased to announce that Michael Wallerstein of Venice, California, has been certified as a member. 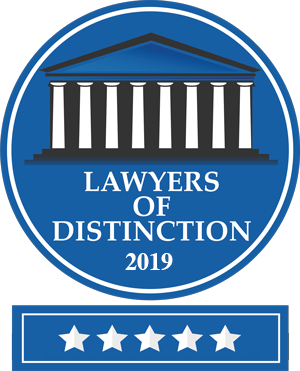 The Lawyers of Distinction is recognized as the fastest growing community of distinguished lawyers in the United States. Lawyers of Distinction shall not offer membership to more than 10% of attorneys in any given state. Members are accepted based upon objective evaluation of an attorney’s qualifications, license, reputation, experience, and disciplinary history. Please seewww.lawyersofdistinction.com for further details concerning membership qualification. Michael Wallerstein is the Managing Partner of Wallerstein Law, a full service law firm in Venice with attorneys providing counseling in Family Law, Estate and Business Planning, Civil Litigation and Immigration. A premier organization, Wallerstein Law strives to achieve results that exceed their clients’ expectations in handling complex and sophisticated matters locally, nationally and internationally. Mr. Wallerstein’s commitment to the Venice community includes providing extensive and worthy pro bono and public service as well as promoting active involvement and leadership on the part of his firm and himself. Lawyers of Distinction uses it own independent criteria, including both objective and subjective factors in determining if an attorney can be recognized as a Lawyer of Distinction in the United States in their respective field. This designation is based upon the proprietary analysis of the Lawyers of Distinction organization alone, and is not intended to be endorsed by any of the 50 United States Bar Associations or The District of Columbia Bar Association.